Isn’t it annoying when you are invited to a symposium or a series of lectures and the presentations are visually more or less narcotic? No matter how good the topic is, without smashing design the presentation will hardly gain attention. Transmit knowledge more vividly and attractive. To simplify the creation of a professional speech, we have designed a collection of unique PowerPoint templates suiting research and science. This special set, available as free download includes 25 high-class templates. 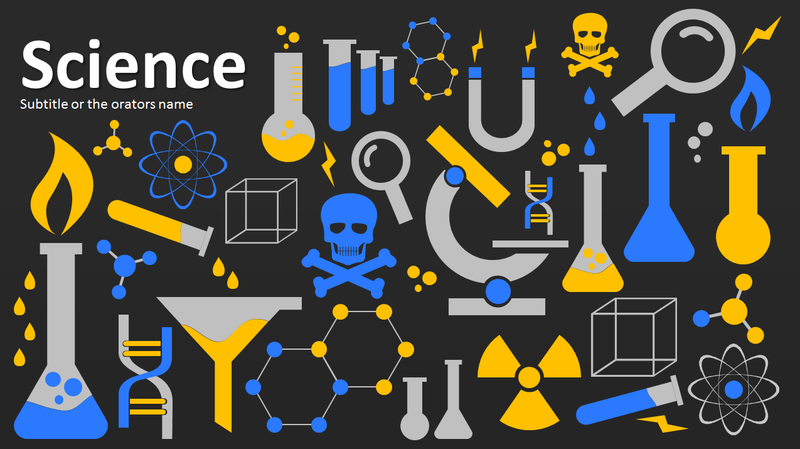 With this selection of exclusive templates you can easily create research and science presentations on an entirely new level. The download package provides you with a basic equipment of PowerPoint slides to create a complete presentation in only a few minutes. You will find title slides, agendas, tables, the periodic table, diagrams, timetables, text slides, graphics, and icons of natural science as well as conclusion slides. Illustrate scientific lectures in a consistent design to convince your audience at research institutes and other departments with a great presentation. These PowerPoint slides are also suitable for teachers, professors and university lecturers. You can use the templates directly after the download. Just paste them into PowerPoint and fill the placeholders with your content, that’s it. You are ready to give your speech. But don’t forget to place your university’s logo on the slides. Regarding creativity, you have many options. And even if you aren’t creative very often: Every design element of a slide can be adjusted with only a few clicks. Change size and color of fonts, color and position of graphic elements, the number of table columns, or the size of text boxes. Even all icons can be colored, scaled and separately pasted on your slides.